I forgot how amazing fall baking smells. The spiciness floating throughout the house, lingering on my clothes, in my hair, up the stairs and into the bedroom. It goes everywhere. Unfortunately it didn't last very long this time around because the mr made popcorn and then the whole house ended up smelling like a freaking movie theater, but for a little while it was so nice. I want to bake everyday just to stink the house up all nice. I might just do that. This bread lasted less then a day. The mr got a couple slices but some littles came over and ate almost the entire loaf. The didn't ask what kind of squash I used, they just ate it vigorously and left heir little crumbs all over. So Bean with her mouth full of bread declared it A-MAZING. From the mouth of a 5 year old. The stuff. The flour, baking soda and powder, salt, and cinnamon are in one bowl. The squash puree, oil, brown sugar, maple syrup, and apple cider vinegar in another .Also need a little plant milk a bit more cinnamon and sugar for topping. Simple simple. Whisk together the dry then whisk together the wet. Pour wet into dry and mix until incorporated. And there you have it. 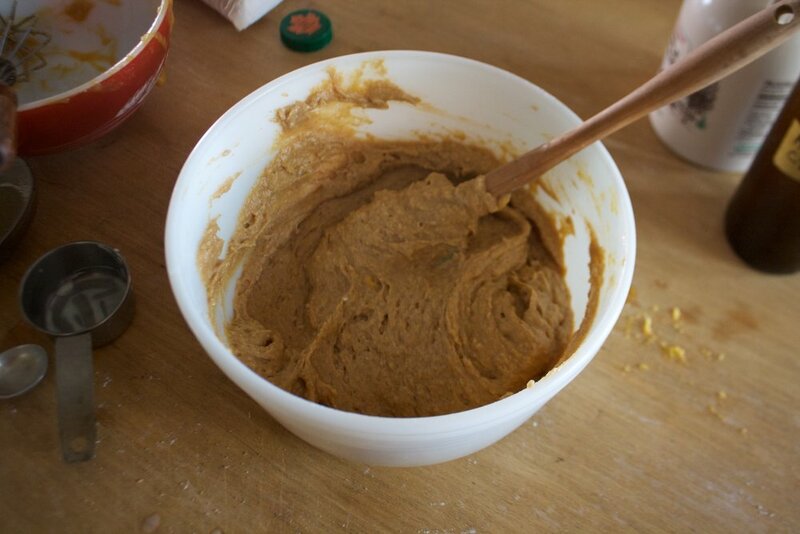 Acorn squash bread batter. Batter goes into a well greased bread pan and sprinkles all over with cinnamon sugar. Then into the oven (preheated of course) it goes. All baked up and cooling. Like what I did there? More circulation to the bottom so it cools faster.. I am so smart. The mr came home right when I was contemplating whether it was cool enough to cut. It wasn't but I cut it anyway. *To make acorn squash puree, stick an acorn squash into a oven at 400 for about 40 minutes or until until fork tender. Remove from oven, cut in half, and let cool until you can handle it. Scoop out seeds (save for roasting) then scoop out flesh (eat skin as snack) and puree in blender. Add a splash of water if needed to get a smooth puree. In a large bowl mix together the squash, oil, sugar, maple, milk, and apple cider vinegar. Mix until well combined. In a smaller bowl, whisk together the baking soda and powder, the tablespoon cinnamon, salt, and flour. Pour wet into the dry and mix until combined. Pour into a well greased loaf pan. Combine the tablespoon brown sugar and teaspoon cinnamon and sprinkle on top. Pop into oven and bake for 60-65 minutes or until a tester poked into middle comes out clean. Once cooked, remove from oven and let cool for a few minutes. Remove form loaf pan and let completely cool. Eat what you want and store the rest in an air tight container for a few days. Can be sliced and frozen too.